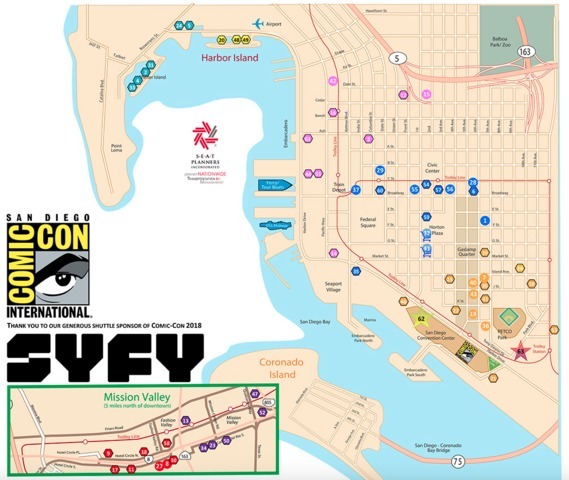 SAN DIEGO (KGTV) -- Comic-Con has released a list of parking and shuttle options for those attending the 2018 event. This year, Comic-Con will offer a free shuttle service for those staying downtown and in Mission Valley. ABM Parking is offering eight parking lot locations for the event. Parking can be purchased on the ParkWhiz site. Once purchased, customers can either print the parking permit or show the QR code on their phone to the attendant at the lot. ACE Parking is also selling parking spaces before Comic-Con. Click here for updates on the parking spaces being sold. Comic-Con is offering a free 24-hour shuttle service that will be stopping in 63 different locations in downtown, Mission Valley and hotels near the airport on Shelter Island and Harbor Island. The service kicks off on July 18 from 3 p.m. to 12 a.m. at Comic-Con’s Preview Night. The 24-hour shuttle service kicks off July 19 and runs through July 22.